The sad and serious outbreak of E. coli toxicity in Europe illustrates many interesting, if in this case tragic, aspects of evolution. In this case, the evolution is fast, close to the gene level, and the theory works very well. The explanation may or may not be (as of this posting) contaminated sprouts from an organic farm in the north of Germany. If the source is eventually worked out convincingly, the reason will be that so much is known about the genes in E. coli and the process by which genes transfer among strains. Normally (and again we're guessing here because the story in the media is not very specific), bacteria carry a variety of self-defense genes on small ring-DNAs called plasmids. During their occasional version of mating, the two mating cells can exchange plasmids. In this case somehow two different plasmids managed to get into the same E. coli cell which then proliferated in some animal's gut (that's where E. coli normally live) and then were spread somehow to other animals and then became a contaminant of the food chain of commercial vegetables--or something like that. It is possible the original gut source was human but again we don't know what the details are from what's been found so far. 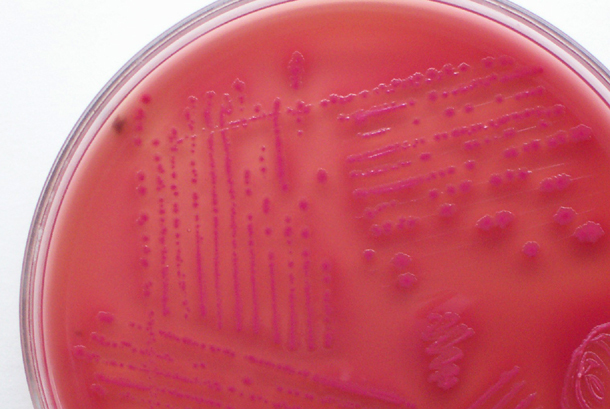 Two mutant genes have been found in these bacteria, suggesting a rare double event history. The evidence suggests the new strain carries genes from two different groups of E. coli: enteroaggregative E. coli (EAEC) and enterohemorrhagic E. coli (EHEC). The combination of these two mutants lead to E. coli with the ability to generate a deadly complication of haemolytic-uraemic syndrome. This affects red blood cells and kidneys and has neurological complications as well. It also contains several antibiotic resistance genes. It is reported that the closest known strain was first isolated from the Central African Republic. We guess from news stories that the bacteria produce two different toxic proteins as a result of these genes. This is evolution in action because it changes the genome of the recipient bacterial cell, and is then inherited by its cellular descendants. Because they reproduce rapidly, and with human agency somehow spreading them around, the new strain can expand quickly. Its new phenotypic properties may or may not give it an evolutionary advantage (if it kills its host before being defecated out to spread further, that's not good for its future), but even if it has no selective advantage over other E. coli strains, it can persist if there's no selection against it. It's because the toxic compounds are single-gene products with clear effects that the force of selection can be manifest, and that its evolution can be traced by comparison of its sequence to extensive E. coli strain sequence data bases. Sequencing its small single-chromosome genome is very quick.